Progesterone Cream: Paraben Free Source Naturals Natural Progesterone Cream features natural progesterone USP from soy. 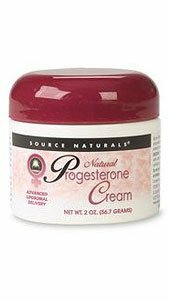 Natural Progesterone Cream is guaranteed to contain 500 mg of progesterone per ounce and 22 mg per 1/4 teaspoon. Deionized Water, Aloe Vera Leaf Gel, Cetearyl Glucoside, Caprylic/Capric Triglyceride, Cetyl Alcohol, Glycerin, Natural Progesterone USP from soy (500 mg per ounce), Wild Yam Root Extract, Tocopheryl Acetate (Natural Vitamin E), Lecithin Phospholipid, Glyceryl Stearate & PEG-100 Stearate, Jojoba Seed Oil, Squalene, Benzyl Alcohol, Phenoxyethanol, Stearic Acid, Grapefruit Seed Extract, Ginseng Seed Extract, Ginseng Root Extract, Sorbic Acid, Xanthan Gum, and Rosemary Oil. Massage 1/4 to 1/2 teaspoon of cream twice daily into smooth skin areas, such as wrists, inner arms or thighs, throat, abdomen or chest. Premenopausal women use for 14 days prior to the first day of menstruation, discontinue and repeat. These are general recommendations only and may need to be modified for individual needs. Please consult your health care professional for specific situations. If you are pregnant, nursing, or intending to become pregnant, consult with a health care professional before using this product. If irritation occurs, discontinue use. For external use only. Do not use around eye area.